Our standard personal automobile policy includes liability protection and other coverages required by law. Uninsured and Underinsured motorist coverages are available as well as collision, comprehensive, towing, and rental reimbursement. A variety of other coverages are also available. Personal Auto Insurance can be packaged with our Homeowner and Farmowner products, as well as many other products. However, there is a discount when the auto policy is packaged with one of our Homeowner or Farmowner products. 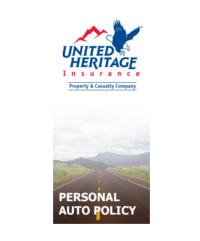 The Personal Auto policy can be written as a stand-alone policy for customers. Farm trucks, motor homes, and travel trailers are also eligible for coverage.